Tag line: "Heroes come in all shapes and sizes...even rectangles"
Based on the children’s book Here Be Monsters!, The BoxTrolls is the 3rd feature film (after Coraline and Paranorman) released by Laika LLC, an American studio that specializes in stop-motion animation, and thanks to its amazing visuals and top-notch cast, this latest entry is every bit as good as its two predecessors. For years, the town of Cheesebridge has been plagued by a group of subterranean monsters called the Boxtrolls (much like a turtle and its shell, each troll wears a box that it can quickly retreat into should anyone happen by). Though primarily trash pickers, the Boxtrolls crossed the line a decade earlier when they kidnapped the Trubshaw baby, infant son of local inventor Herbert Trubshaw. As a result of this heinous crime, the town’s mayor, Lord Portley-Rind (Jared Harris), hired exterminator Archibald Snapper (Ben Kingsley) to seek out and destroy every last Boxtroll. Hoping it will gain him admittance to the Society of White Hats, a cheese-tasting club reserved for the town’s most prestigious citizens, Snapper, aided by his henchmen Mr. Trout (Nick Frost), Mr. Pickles (Richard Ayoade) and Mr. Gristle (Tracy Morgan), has been diligent in his pursuit of the underground creatures, and has thus far captured more than half of them. What nobody realizes, however, is that the Boxtrolls are a peaceful species, and have lovingly raised the Trubshaw baby, now affectionately known as Eggs (Isaac Hempstead-Wright), as one of their own. In an effort to save them from total annihilation, Eggs and his new friend Winnie (Elle Fanning), the mayor’s daughter, try to convince the rest of Cheesebridge that the Boxtrolls mean them no harm. But with Snapper set to unveil a new secret weapon in his fight against them, it looks as if the Boxtrolls’ days may be numbered. The world of The BoxTrolls is a wondrous place, starting with Cheesebridge itself (from a distance, the town looks like a mountain of houses piled on top of each other, with the Mayor’s residence as its peak) and extending downwards to the underground lair of the film’s title characters, where garbage is magically transformed into useful everyday items and the ceiling, filled with illuminated boxes hanging from ropes, looks as if it were a star-filled sky. To give voice to its bizarre characters, co-directors Graham Annable and Anthony Stacchi turned to a number of talented performers. Sir Ben Kingsley shines as the villainous Snapper, providing the movie with a memorable bad guy while getting a few laughs of his own (so anxious to fit in with Chesebridge’s upper crust, Snapper ignores the fact that he’s actually allergic to cheese). Also funny are Frost and Ayoade as Mr. Trout and Mr. Pickles, who, despite being Snapper’s accomplices, are convinced they’re the “good guys”. Rounding out the cast are Hempstead-Wright and Fanning, quite strong as the young heroes of the piece; Jared Harris as the incredibly self-absorbed Mayor; Simon Pegg as the eccentric inventor locked away in Snapper's dungeon; and Tracy Morgan as the insane Mr Gristle, the least talkative (and craziest) of Snapper’s henchman. Also worth noting are the contributions of Dee Bradley Baker and Steve Blum, who, in bringing the various Boxtrolls to life, created the creature’s unique way of communicating. 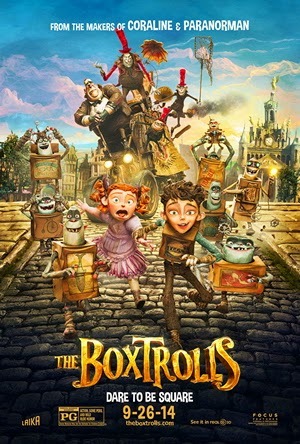 Though it does feature a few images that might prove troubling to younger kids (Snapper’s allergic reaction to cheese, swelling up like a balloon whenever he eats it, can look pretty gross at times), The BoxTrolls is an excellent family film that, with its message of individuality, is sure to appeal to parents and children alike.